Kids Helpline, ReachOut, Suicide Callback Service and QLife will share an additional $2 million over two years for telephone, webchat and online mental health help. So Professor McGorry made very clear that this financial injection must be just the beginning. “We need to finish the job of national coverage,. … What’s really missing is expert, team-based care that organisations like Orygen provide, and which is in very short supply. a significant allocation of funds for mobile and home-based interventions. These are just SOME of the things that all mental health peak bodies and advocates MUST continue to lobby for. Those at the severe and complex end of the spectrum are too often overlooked – perhaps because they are smaller in number than those for whom Headspace and other early intervention programs can achieve positive outcomes. But the more severe and complex, the more serious the ongoing impact on young people, their family, friends and wider community. The suffering that many endure is impossible for most people to imagine. Severe and complex youth mental health issues are 24 hrs a day, 7 days a week. So professional management of the multiple services that are inevitably required will be a key aspect of delivery. Available and accessible integrated, multidisciplinary programs that encompass treatment, education/training and rehabilitation are vital. And until those are adequately funded on an ongoing basis, the government still has much to do to make mental health the priority that it must be. 10 months ago, I posted on the BLOG page of severeyouthmentalhealth.org – where pieces that have personal perspective, analysis or opinions appear (other posts are News and aim to focus on facts and information about developments etc.). I had been compelled to write about the findings of the Barrett Commission of Inquiry in relation to the transitions of patients. 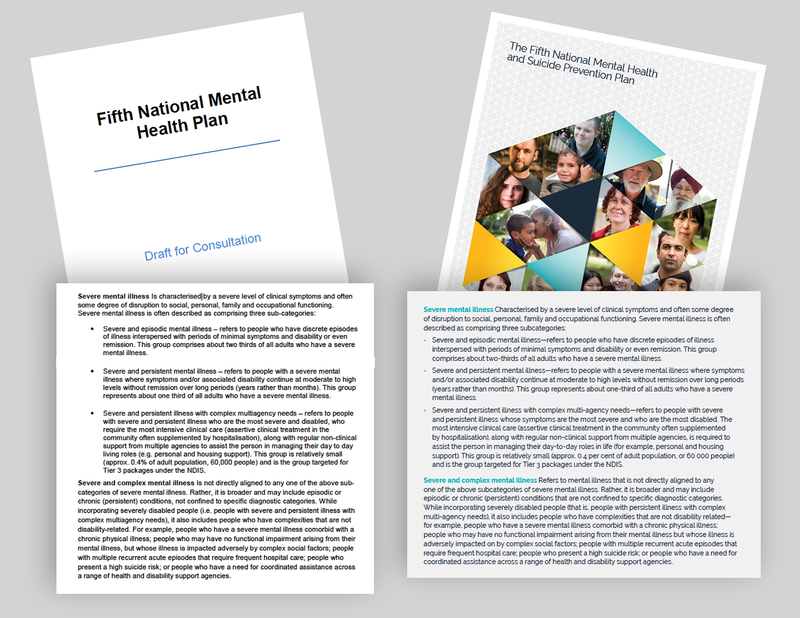 As independent reviewers undertake a look at the transitions from adolescent to adult mental health services, particularly in relation to those suffering severe and complex mental health issues, I would urge anyone who is unsure of what they can contribute to read that July 2016 post which reflects on how the Barrett families felt in relation to the findings of the BACCOI on transitions. These families know what needed to be done and what was overlooked and I am confident that they are not the only Queenslanders with this kind of insight. So now is the time to do whatever you can to share your knowledge and experiences – or encourage others to do so – so that the young people who need the best support, the most carefully planned and gradual transitions and our best efforts in all the services they require in order to finally see a light at the end of the tunnel have access to what will not just improve their lives but, in some cases, save them. NOW IS THE TIME TO SAY WHAT NEEDS TO BE SAID. Through processes that ensure confidentiality but that also will mean that the input given IS ON RECORD and MUST BE TAKEN INTO CONSIDERATION. The next few weeks provide key opportunities for those who understand what’s needed to contribute to providing those very things. On behalf of all Queenslanders who are affected by severe and complex youth mental health issues – now and in the generations to come – I implore you all to give your expert input. From those who have seen the reality to those who can shape the future – the vital passage of ideas is the only way we can get closer to the right support for those who need it the most. This is a unique opportunity to genuinely contribute to the specific services and support required for all young people and families in Queensland dealing with severe and complex mental health issues. We cannot change the past – and we will continue to support those whose suffering continues as a result of what has gone before – but anyone with an interest in this vital area of service provision can now be HEARD and RESPONDED TO. Please become a part of the movement towards valuing our young people and those who care for them in the way that they truly deserve.